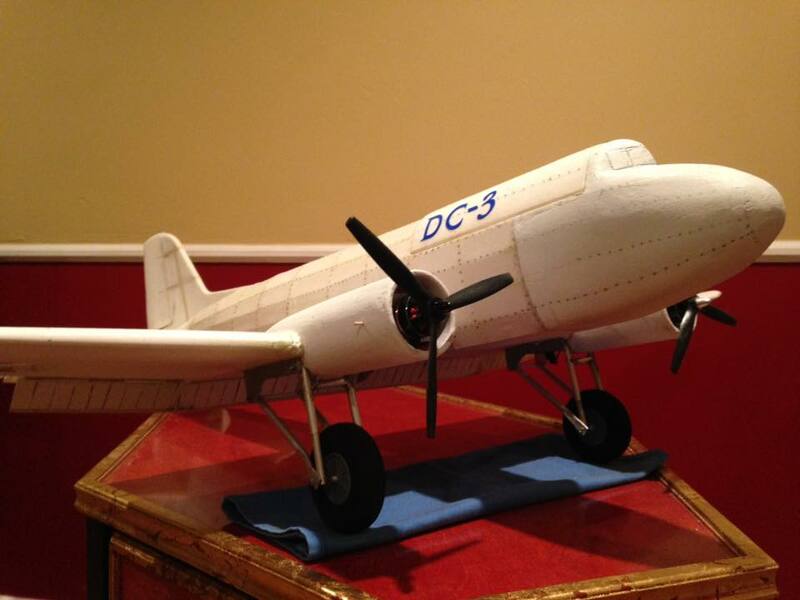 If FliteTest developed a DC-3 model, would you buy it? 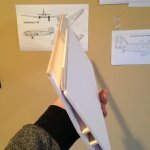 The plans for the fuselage and wing come from rcfbaircraft.com . They were 2 dollars and were quite comprehensive. While numerous changes were made, the plans were invaluable to the final form. 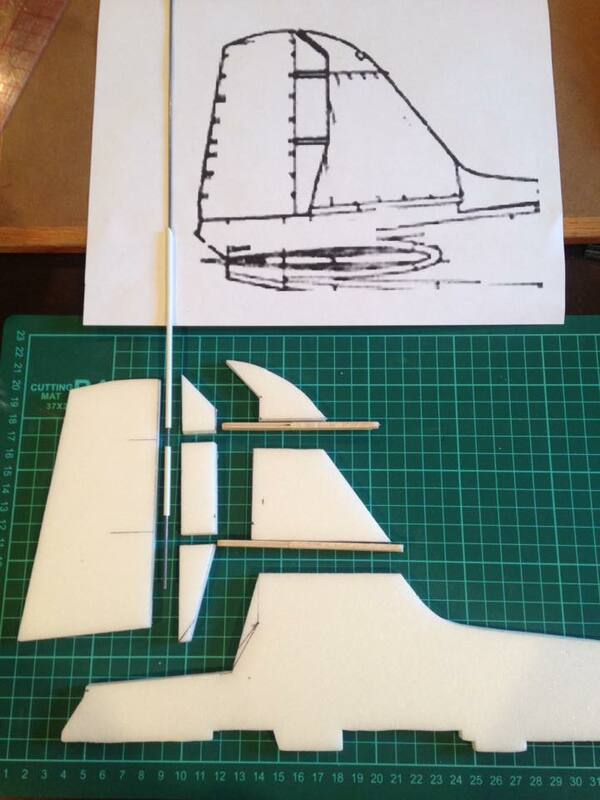 I began with the rudder. I stripped the paper from the foamboard and laminated two pieces together. To achieve the balanced rudder effect, i cut a rudder blank from the plans into segments to allow the placement of plywood hinge points. Not shown in this image is an extremely thin pine spar on one side of the stab. The wing sections are of a familiar foamboard design, with two plywood spars. In retrospect the spars recommended by the plans are extremely weighty. Almost 80 grams, and not oriented properly. I would recommend your own spar design. 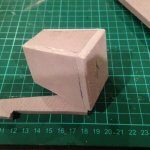 Joining the spars was also very difficult, and i will admit to using a lot of expanding glue in the joint area. You can see the addition of some wide foam ribs. these were initially intended to provide support for the gear and engine nacelles, but was not necessary. I would use depron or balsa ribs. You can see that the folded board wing makes a split flap quite easy to place. This is a balsa flap that was not used. I wanted the flaps to be extremely tight in tolerance because i am using one servo. They are accomplished with pieces of sequential diameter aluminum. 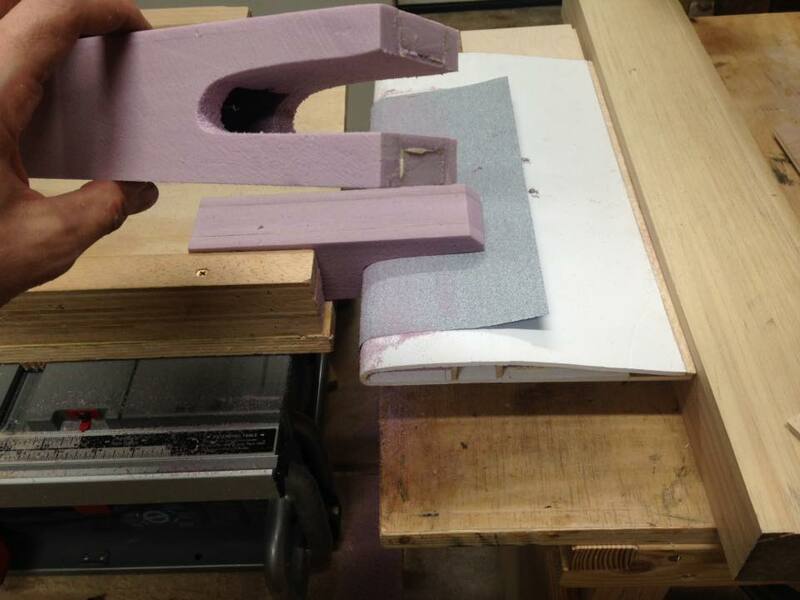 Once placed, a pin and hinge is used to join the center flap to the angled flaps on the outboard panels. Examine the different angles that the pin must point to prevent binding, glue it into place somewhere between these two values. At only 18 grams without servo, these flaps operate extremely smoothly. Okay, that's all for today, next time, shock absorbing main gear, and shock absorbing tailwheel. Oh, and an interesting note- DTFB is 2/3 paper. It is also not particularly good at bearing loads unsupported over a wide distance. Partial failure results in a permanent wrinkle in the paper. This isnt fun on a tail surface. Removing all paper and instead laminating 2 sheets of the interior foam together, results in a structure that is approximately 2/3 the weight, but is TWICE the width of the original. 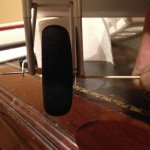 This dramatically increases the effectiveness of any spars used on the surface of a stabilizer. The stab can also now be shaped into an airfoil. Also with this technique, simple slab stabilizers can be implemented on larger models. That looks amazing! Nice work! Jes, that´s a real plane! I´m building the same thing just a bit larger. How did you do the wingconnections? I hope the best for your peojekt! Probably the most intricate and well thought out RC plane I have ever seen at that size. A great paint job is going to make that thing a keeper. Jetcrafter- All three wing panels used two plywood spars oriented vertically and placed one inch apart (at the center section and joints, then tapering to the tips. The plans called for a pair of ply wing joiners at each joint, going a few inches laterally into each wing panel. However, since i used expanding glue and ribs, the joiners could not fit. For this reason i used a much smaller joiner, one in each joint, and used liberal amounts of expanding glue. much of this glue contacts a rib close to the joint. 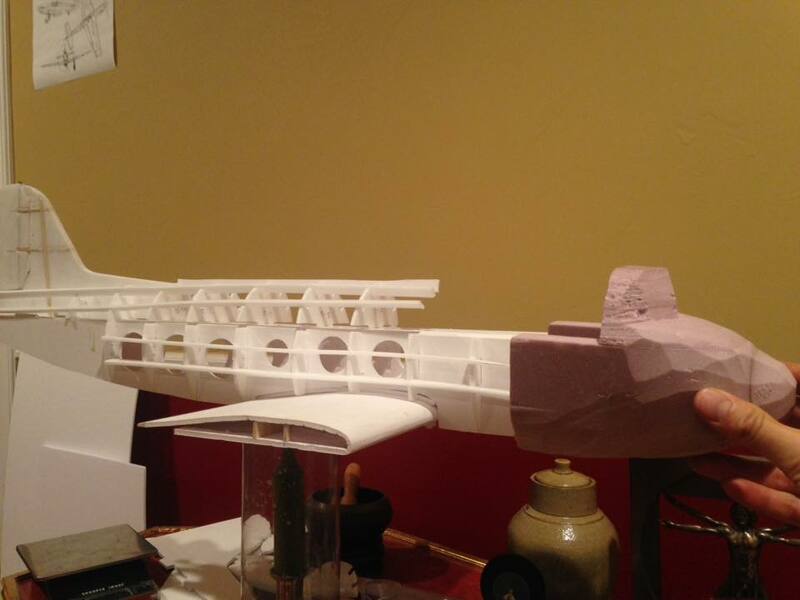 For future projects i would recommend placing the ribs at the very end of the wing panel, so that they can be glued directly together. 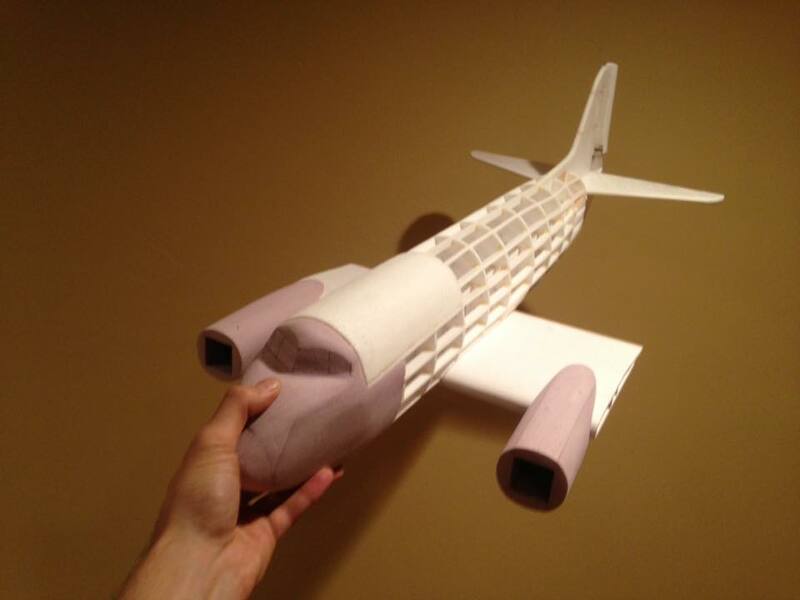 And finally, much of the force in my model is being held by the paper skin below and above the wing. on a model of tighter tolerance, one could lay a piece of epoxied tape over the seam, similar to joining two pieces of fiberglass. thanks Jared and thanks farmer. I have good feelings about this one, my first former-and-stringer build. Looks great! Is the plane at the top of the thread the final product? Has she flown yet? A post to finish up on the wings. To clarify and prevent my error, this is the order of operations for assembling the wing in this fashion. 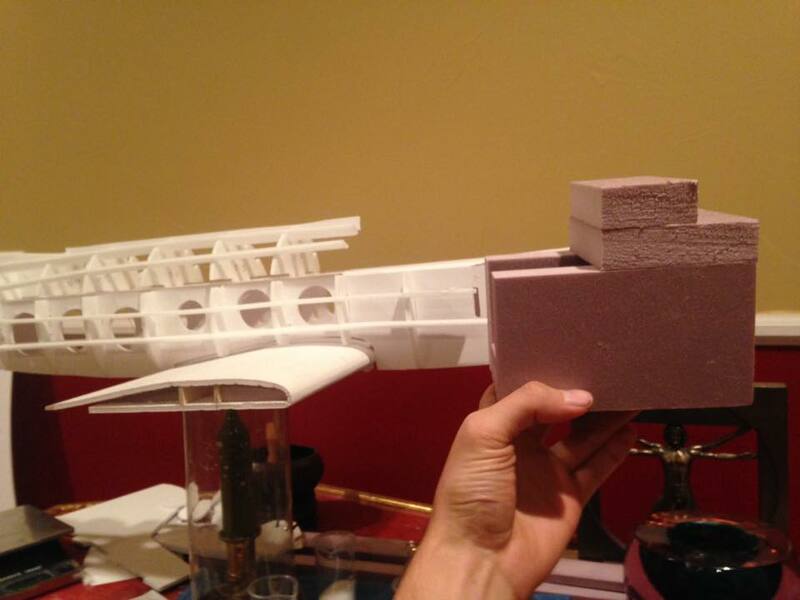 1) Complete all wing panels (separately), engine nacelle blanks, landing gear mounts, and fuselage. 2) Use the airfoil of the center section to sand/cut the wing saddle and nacelle saddles. 3) Sand the nacelles round and other touches. 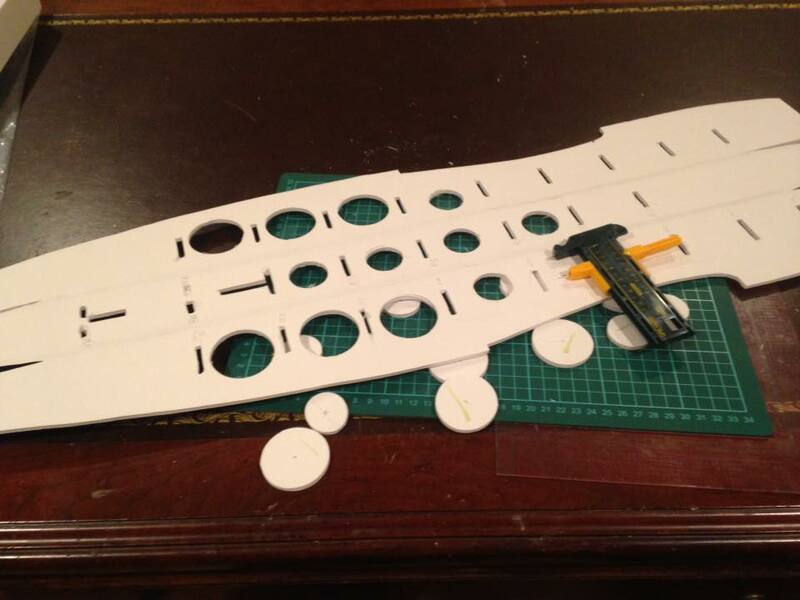 Cut mounting holes in wing. 5) THEN glue on the nacelles and landing gear. Mount servos. etc. 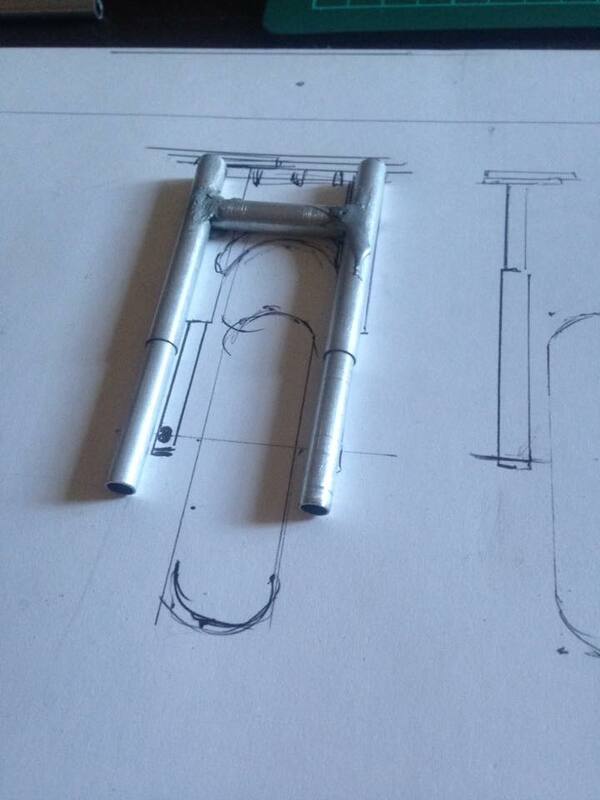 here you can see how I made the wing mount 16grams.in.plans - 10grams.in.final. Epoxy was simply globbed onto the threads and the bolt was broken out easily after setting. This way the nut does not have to be on the outside. Instead the bolt rests on a washer or grommet on the bottom of the wing. The plate acts as the female to the bolt male. This plate rests level inside the fuselage. Nacelles were saddled by wrapping the leading edge in sandpaper, and placing the nacelles in my table saw sled. The sled can move back and forth to cut the foam. The Landing gear mounts go straight up between the spars, but that detail shot will be in a later post. MAIDEN is tomorrow morning! Glamour shots to come. Good luck for the maiden! wow that looks so fancy! cant wait to see the finished product! Maiden went extremely well. I will offer the details at the end of this log. ON TO THE LANDING GEAR. 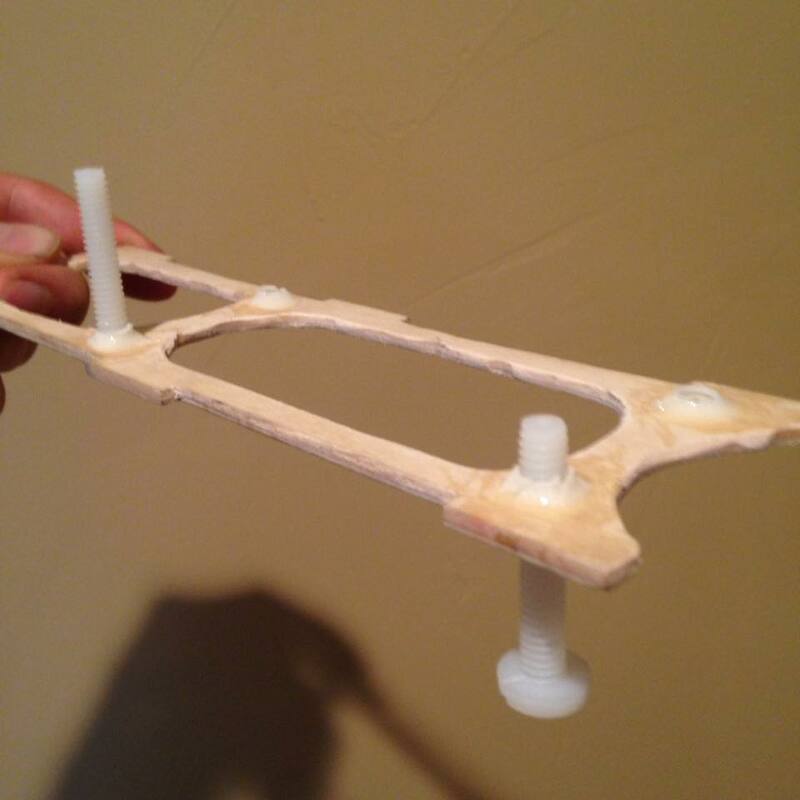 The landing gear used aluminum tubes of 2 diameters. It is easy to select these from craft store racks. One should slip perfectly inside the other and have no kinks. Larger diameters will bind less i think. Cut carefully. A razor blaze actually seems to work. Sand any ragged ends TOWARD THE CENTER OF THE RADIUS with very fine sandpaper. 1000 grit paper for finishing. The outer tube of the suspension is used as the top piece. I forget why, but i remember clearance issues. The outer tube should be as long as possible before contacting opposing obstacles. 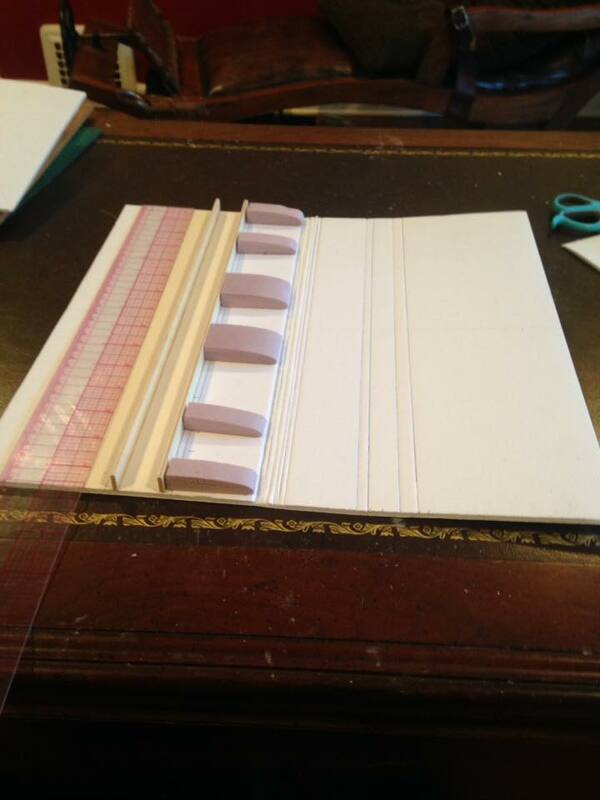 This keeps as much overlap as possible, preventing binding or slipping out. This is the top portion of the gear. The support bar is aluminum soldered (not easy). The support bar may not be necessary but i wanted it to be present to maintain tolerance. The support is placed high to prevent contact with the wheel. The top of the two tubes has a hole cross-wise to allow the entry of a top axle/hinge. This will be the mounting point to the wing. Two more tubes of the smaller diameter are cut and also get holes at one end to hold the main axle. Springs go inside before inserting the bottom tubes. They will contact the upper axle and apply their pressure there. 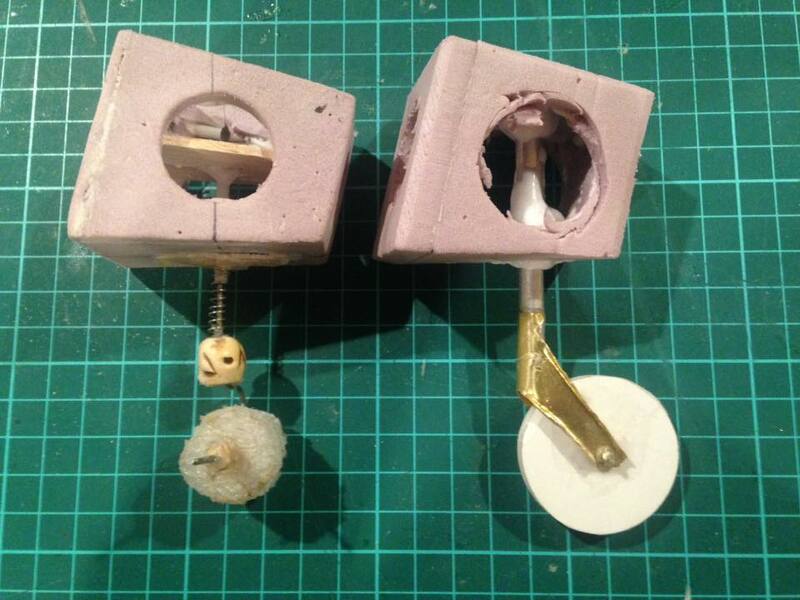 The rubber bands loop AROUND THE TOP AND BOTTOM AXLE to keep the assembly together. 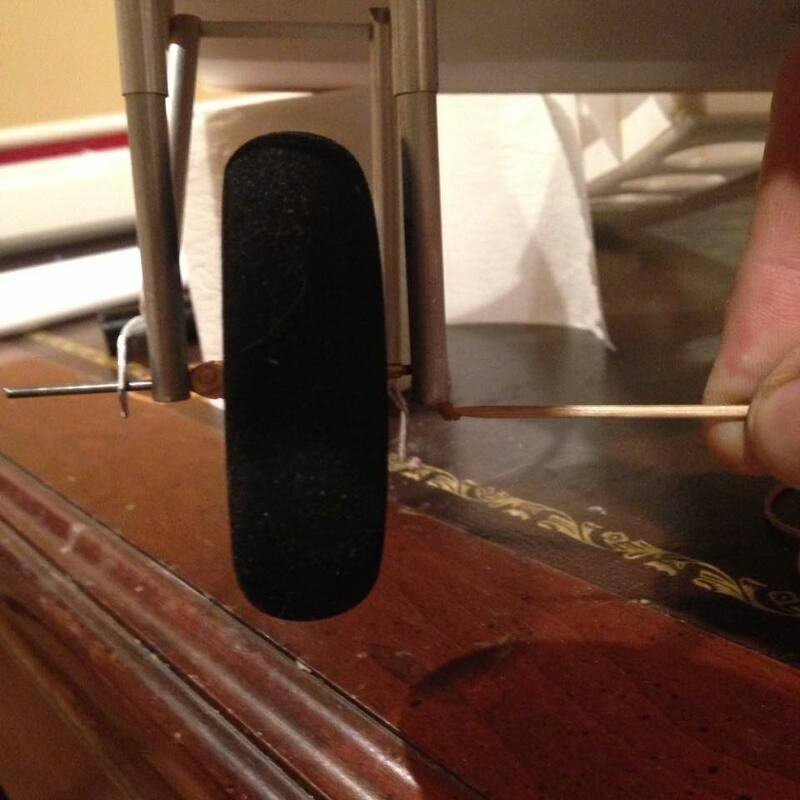 Any excess tightness in your rubber bands will decrease the effectiveness of the springs. The assembly now needs to be held in place from swinging. 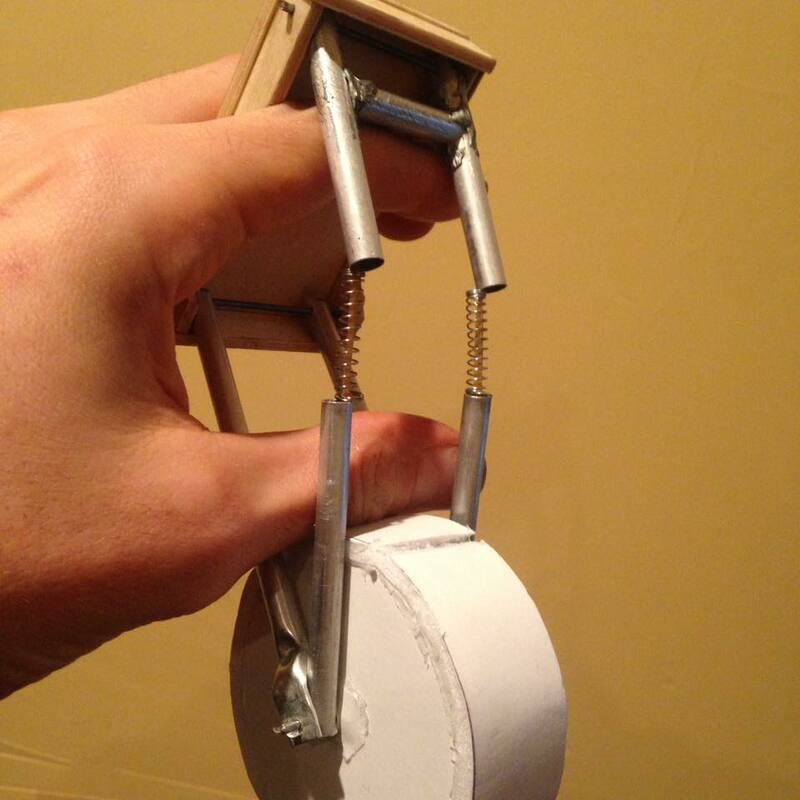 This is accomplished with two more aluminum tubes, which go on a third axle and meet the main axle. Assembly can be a handful. 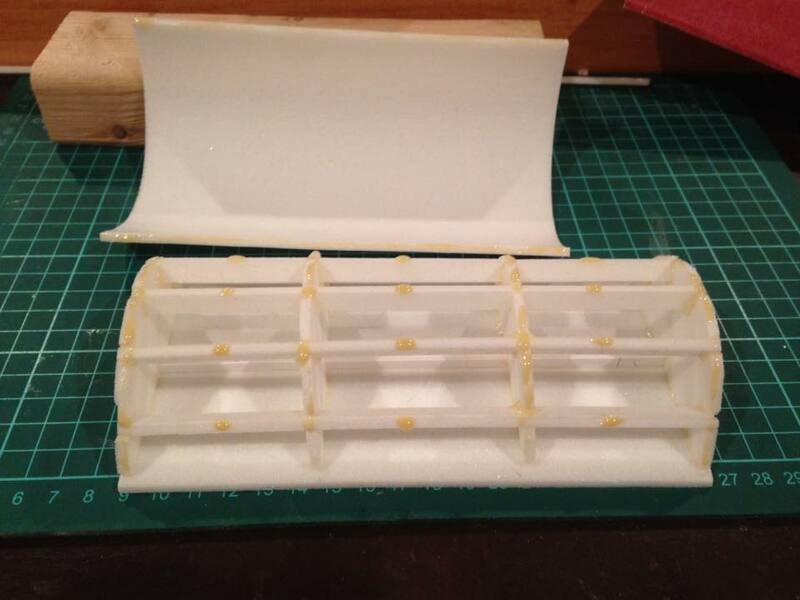 STEP1) insert rubber bands into tubes so that the top axle will easily capture them when slid into place. Slide top axle into place. STEP2) place springs on a wire-and-hook. hook the dangling rubber bands. Slide springs into the tubes. Repeat with the inside tube. The rubber bands will be under tension. Hold them out by using toothpicks as temporary axles while you get the axle in place. STEP4) Remove temporary rubber band holders. I used springs from G4 ball point pens. They are nice and wide and did not need to be changed. They are exactly the diameter of my inner tubes. While the original was mounted to a plate with side walls as axle hinge points, the final version saved weight by only having the side walls, which intersected the conveniently vertical spars. It is extremely robust. The rear top axle is as low as possible. This prevents over extension caused by rocks or snags pulling the wheel back. It also reduces the forward travel of the wheel under compression. This last shot shows bands on the outside but that is irrelevant. These operate very smoothly. They hold about 2x weight of craft before bottoming out. I cant wait to try some firm stalled landings with a lot of nose drop. They didn't seem to compress at all in action, but they definitely did their job. I can help but believe the friction works as suspension dampening, preventing bounce. This gear is lightweight. Really. What is the weight of this landinggear and how did you join the aluminium tubes? My gear has got a weight of 80g but they are retracable and i build them out of a aluminum sheet, not from aluminium tubes. Do you have a video from the maiden? It would be verry interessting! Anyways i like your plane! 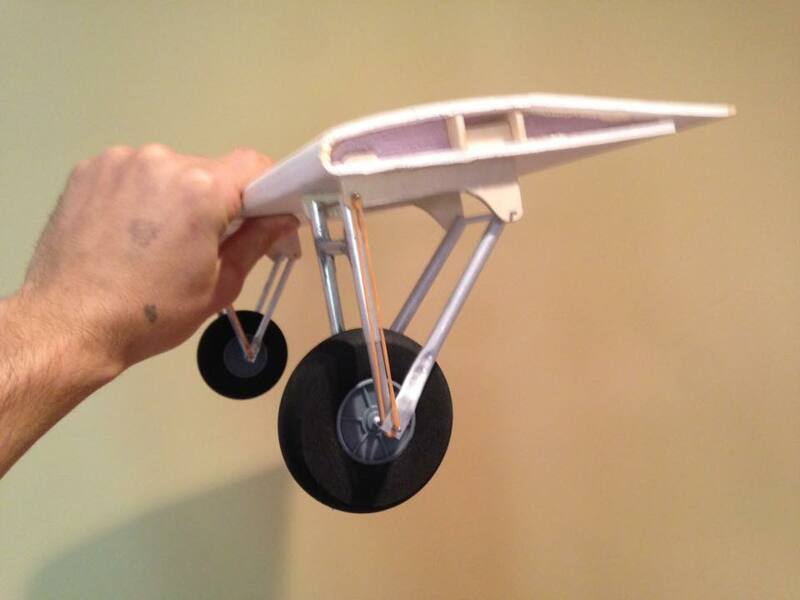 The weight of the landing gear is 54grams for both main gear including tires but not including plywood mounts. The aluminum tubing weighs probably much less than one gram per inch. The springs and rubber bands light as well. Most of the weight is in the tire and steel pins. Tubing is more efficient than bar of the same material. This is because the most highly loaded area is on the surface of the material. Thickness-- or distance between each side of the load bearing system -- is a major factor in strength. Tubing has the inneficient inside material gone. The aluminum tubes were joined using an "aluminum welding rod". This was a stick of solder with a melting point below that of aluminum. Be very careful with your torch not to blow through the aluminum. Insert the inner tubes while soldering to help dissipate heat and prevent blow through. Aluminum creates an awful barrier the instant it contacts the air. For this reason, you must SCRATCH UNDERNEATH THE MOLTEN PUDDLE OF SOLDER TO GET IT TO STICK TO THE ALUMINUM. Honestly its a terrible method at this scale and i would suggest using epoxy or a bolt or a brass strap. 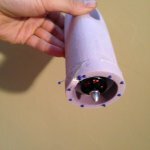 You could also make the upper tubes out of brass and solder easily. That would look beautiful 2 tone color. Heavier but still workable. 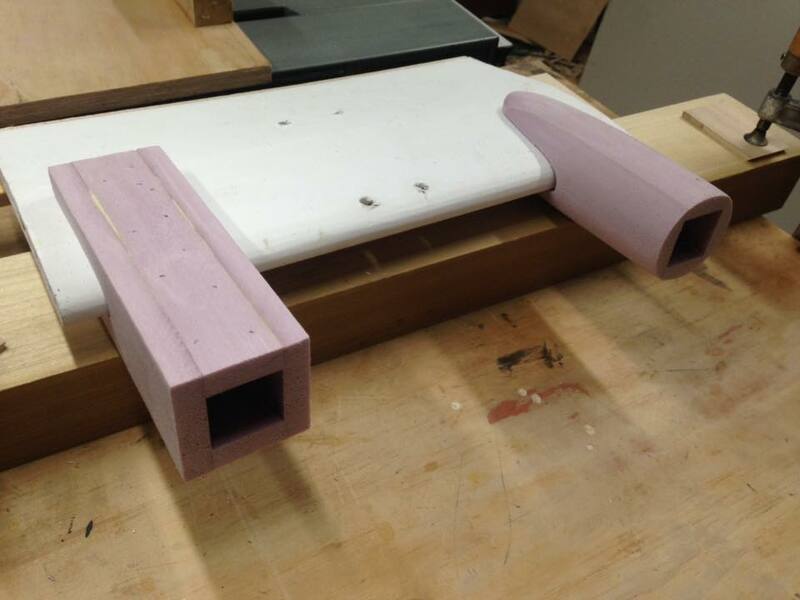 All tailwheel designs began with a box made of the pink insulation foam and gorilla glue. DTFB could be used as well. A plastic tube is epoxied into place. 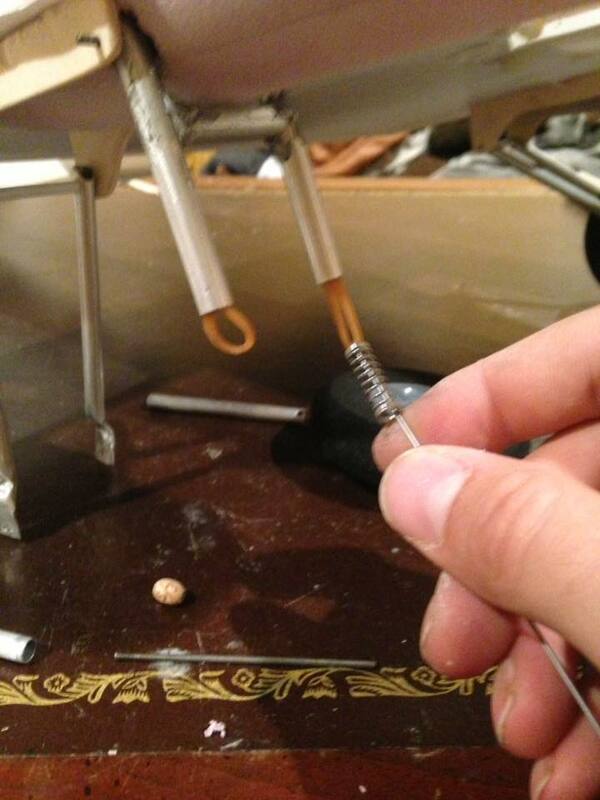 Be sure where the tube contacts the foam, there is a THIN, HARD plate or a wide base of glue. Otherwise you know what happens. a plate was inserted midway into the box to allow the tube to be shortened. 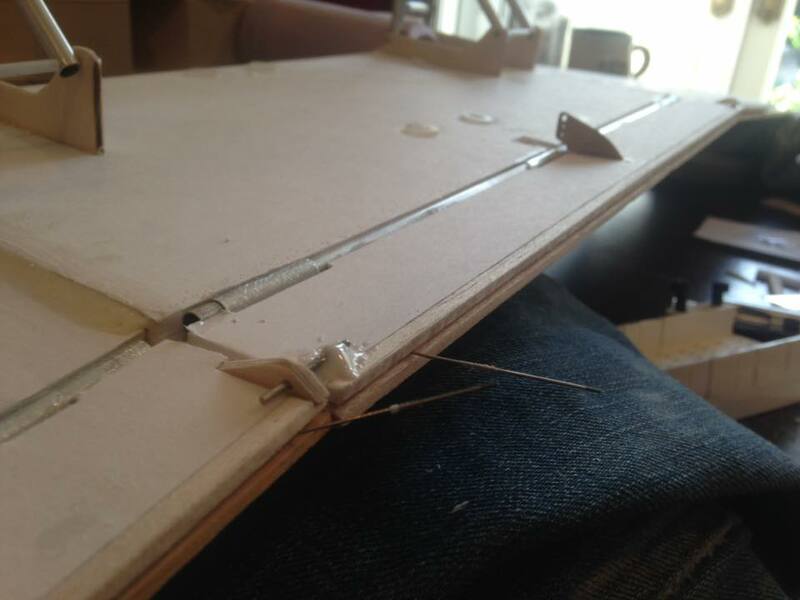 This way a gob of hot glue can keep the tailwheel from falling out from gravity. A spring is added with any kind of centering bead. This will keep the spring from flopping to the side over the asymmetrical shape of the tailwheel steel pin. This describes the unit on the left. The unit on the right was a test of a castoring aluminum tailwheel. This method showed promise, but I made an improper geometry of the box, and abandoned the effort for time. A very gentle binding seemed to hang up this system. 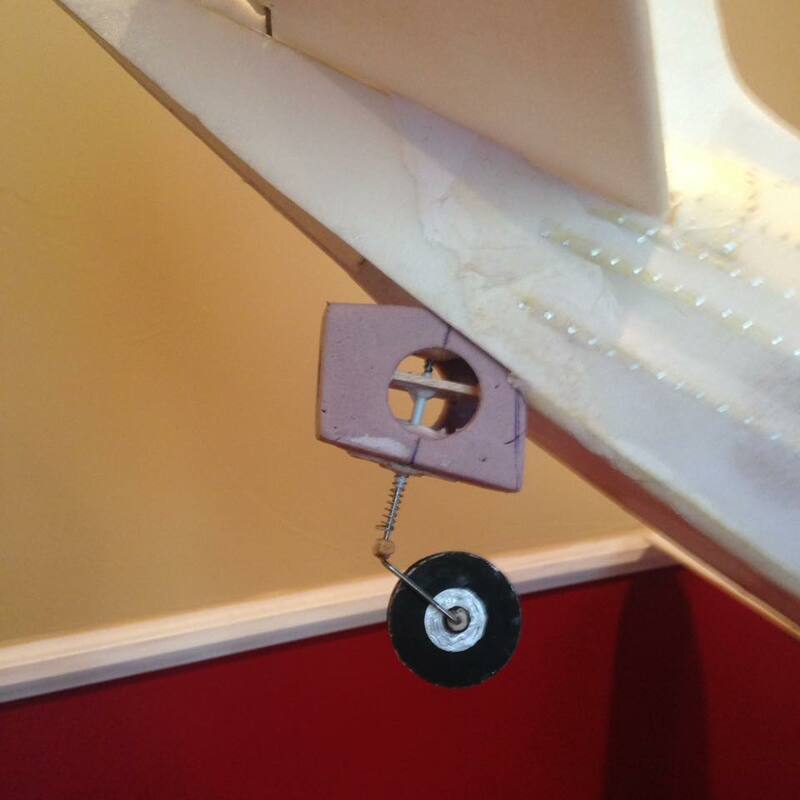 Again, proper geometry of the tailwheel is necessary for a usable free castoring wheel. Having more TRAIL in the wheel system will help give other forces authority over the wheel. And finally, a video of the gear in operation. The fuse begins with an FT style rectangular tube. I removed a large amount of material and i could have removed more. The plywood wing mount is placed inside - over the wing saddle - when folding up. Formers are keyed into slots on the sides and top to achieve the shape of the fuselage. Formers are identical from front of the frame to the wing TrailingEdge. Then they become smaller from the wing TrailingEdge to the tail. Stringers are keyed into the formers. 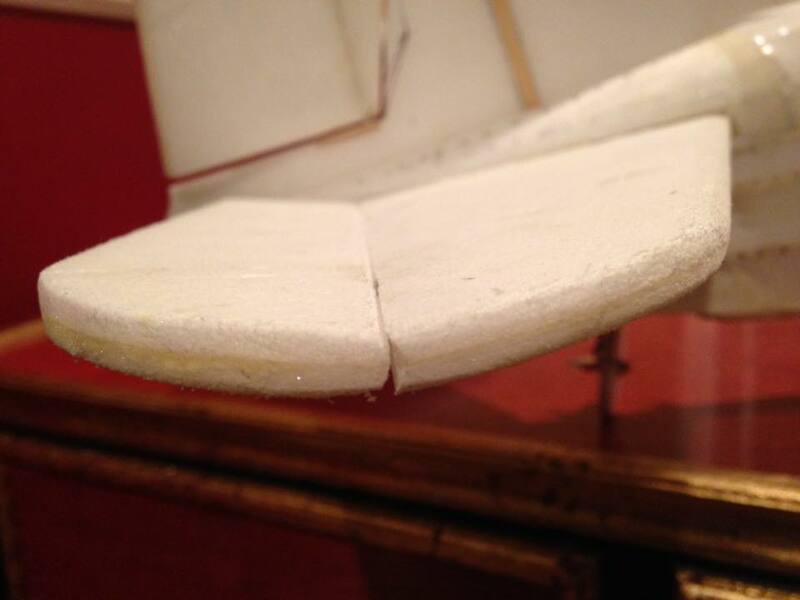 I ran horizontal strips of foam in the wing saddles for a consistent and soft surface to kiss the wings. 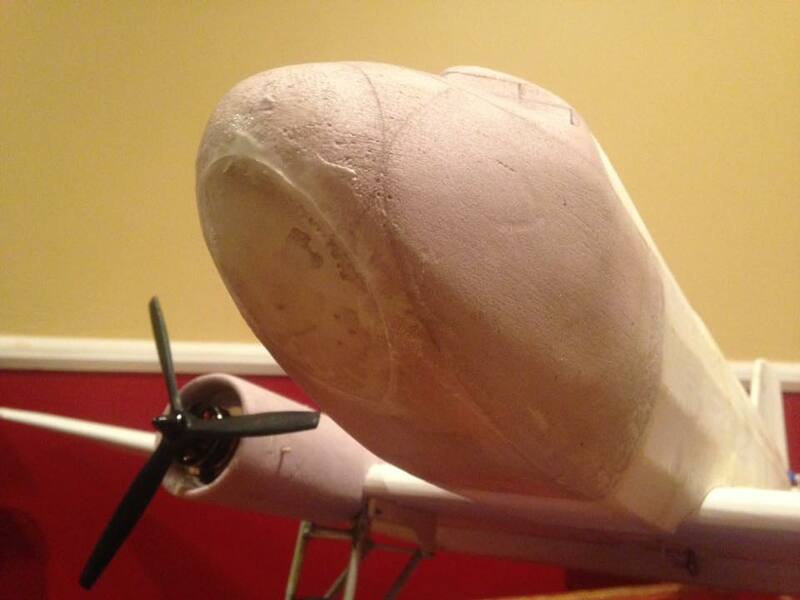 I also sheeted the surface of the fuselage above the wing saddle to prevent deformation. This is also an excellent gripping place for checking CG. It may also be necessary for the tissue to have a termination point there. I cut off the nose suggested by the plans at one of the former locations. Instead I used more pink foam to build a polygon nose. 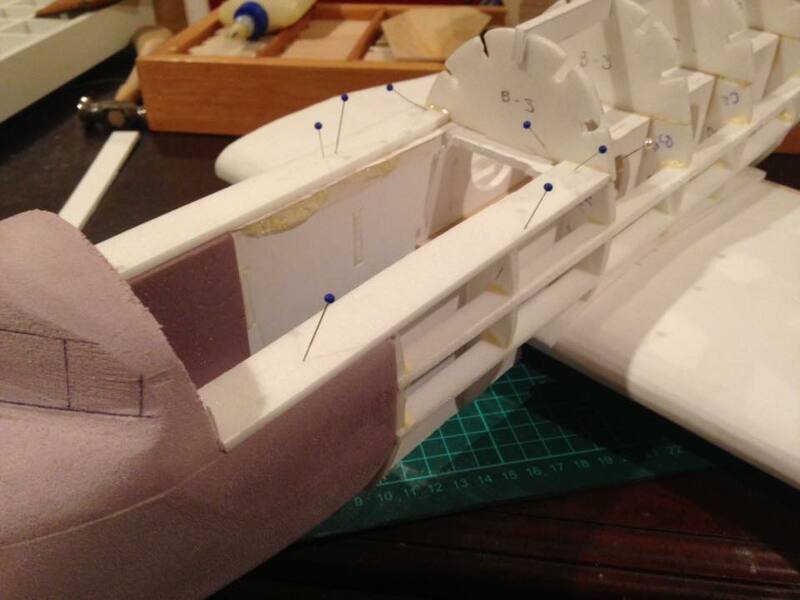 The interior walls are made to line up with the box frame of the fuselage. The exterior walls are cut and sanded to shape. Leave the nose/fuse joint perimeter oversize to fine sand before finishing. This way it will line up with the fuse. A strap of foam bridges over the connection of the nose. This gives a consistent surface to sand when fitting the battery hatch. The battery hatch is made of the same formers as the top of the fuselage. I used a curved portion from a soda bottle and some lightened epoxy to make a skid pad for nose-overs. 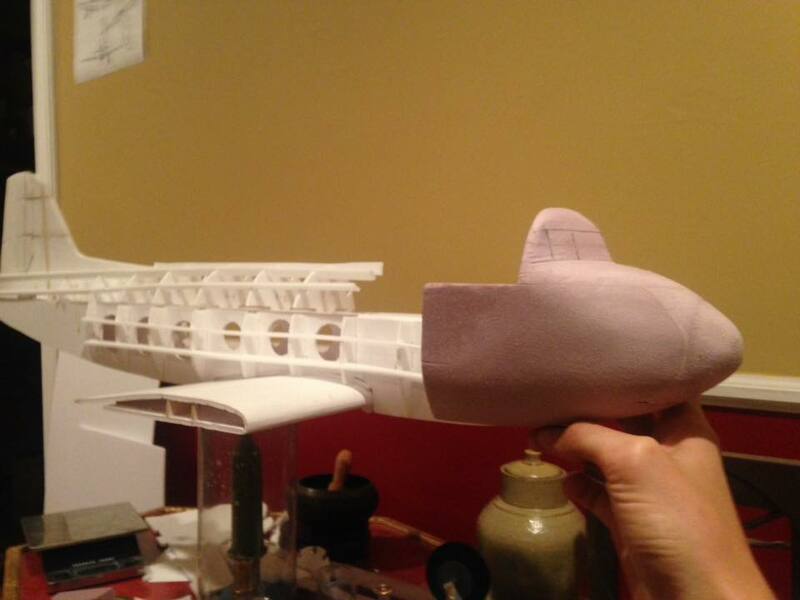 The entire nose and nacelles are epoxy filled to sand and to make painting with spray cans an option. The ribs are covered with regular tissue and type1 Wood Glue. Wood glue that re liquefies with water. So far it has not been properly sealed. wow! why the lightening of the inside fuselage part? to save weight for the details? that main gear is wicked cool though. aslo, i voted no on the poll. let me explain. if it was a speed build kit, no because i would use the plans. that is what i interpreted it as. if you meant like a real model like pre built like other companies do then maybe. depends on the price and how well the plane suited me. Took off with half flaps in 8mph wind. 15mph gusting. Liftoff is clean. Tail rises as expected and drops late after landing. Climbs gently under full throttle. No trimming. Flies steady but needs attention, just like every old man ever said about the DC-3. Entered a spin immediately on stall test. Perhaps my rudder is oversize. This is expected to be my "rudder coordination trainer"
Full flaps seemed to increase the tendency to become unstable. It did seem stable in descent and landing phases though. I flew at half flap most of the time to stay away from the nearby jets. Lands like a kiss from an angel. Ground handling was nonexistent. Unless powering for takeoff, the plane only weathercocks into the wind. Very sturdy. I want to get some slow motion shots of slamming the gear down. It hardly seemed to compress at all with a proper landing. Just like the classic, this one could operate for a long time. Low flight time however. 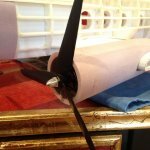 Anyone can see im running too small a battery/ props/ esc. Im goingt to try to fly it on 2 cells with 7 inch props. Does anyone know how i can get rid of that poll i made? This isnt really the place for it. that lady in front of the cameraman was filming in portrait. that annoyed me lol. also nice and slow! i was expecting it to fly faster!